A new partnership between two Niagara organizations will mean a direct connection between the people conducting leading-edge research on child mental health and the caregivers who work with families dealing with related issues. 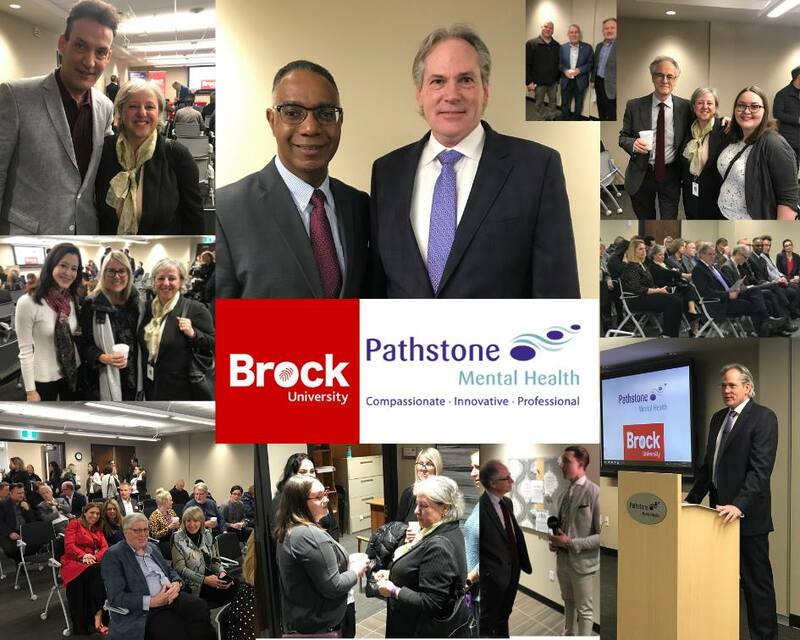 Pathstone Mental Health and Brock University signed a Memorandum of Understanding (MOU) on Friday, March 22 that solidifies a collaboration that will positively impact children suffering with mental health in Niagara and beyond. Friday’s announcement took place at Pathstone’s Branscombe Mental Health Centre in St. Catharines, where Brock faculty members and students have been provided with office and lab space, giving them direct access to children and families interested in participating in groundbreaking research. • Associate Professor of Psychology and Director of Neuroscience Dawn Good and PhD candidate Caitlin Gallant are researching the neuropsychological and socioemotional factors that predict the severity and complexity of mental health challenges in children and youth. • Professor of Psychology Sid Segalowitz and Associate Professor of Child and Youth Studies Ayda Tekok-Kilic, along with a number of students, are using an electroencephalogram (EEG) installed at Pathstone to study anxiety disorders and ADHD. By examining brain activity, researchers are able to evaluate in what way interventions are effective when appearing to use standard psychological measures. • Professor of Recreation and Leisure Studies Colleen Hood and PhD student Lauren Cripps are examining the impact of therapeutic recreation intervention designed to support the development of positive identity for youth with mental health challenges. • Associate Professor of Psychology Angela Book and PhD student Nathalie Gauthier are examining factors around anti-social behaviour and specifically looking at how parenting style may mitigate the effect of childhood adversity on these behaviours. • Associate Professor of Child and Youth Studies Tricia Vause is launching a project evaluating the benefits of blending behaviour therapy with recreational dance to equip children with coping strategies while giving them the added benefit of improved motor skills, self-esteem and helping them form new friendships. • A collaboration between Professor of Linguistics Gary Libben, Professors Tekok-Kilic, Segalowitz, and their students and postdocs will develop an EEG tool for assessing reactivity to common words with negative/positive versus neutral connotations (such as ‘destroy’ vs ‘build’ vs ‘change’) to assess vocabulary and emotional reactivity in children and youth with psychological challenges. In addition, Brock’s Faculty of Education is working with Pathstone to develop a training program aimed at helping teachers deal with complex mental health issues in the classroom. Segalowitz, Director of Brock’s Centre for Lifespan Development Research, which has worked with Pathstone for a number of years, said the MOU also offers Brock students across various faculties unique opportunities for experiential education. Bill Helmeczi, Pathstone Director of Strategic Planning, Standards and Practices, called it a dynamic and positive partnership.